It's not just a smaller size of an existing lure, the Booyah Micro Pond Magic is a unique, fish catching bait! 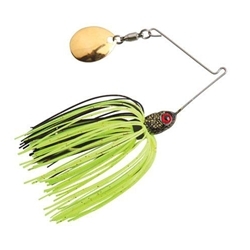 The 1/8oz spinnerbait features a true-running "R" bend wire for incredible vibration adn a single colorado blade. It comes equipped with realistic 3D eyes and a high quility Mustad round-bend hook.